I have managed to fight of the little bit of jetlag that consumed me following my recent trip to Florida, and am recovering at home in Devon for a few days before I head back up to the North East to begin my third and final year of university...it's scary to think that 10 years ago this September I began boarding at school in year 7. Now most of my school chums have graduated from their respective universities and are heading out into the real world to begin jobs and careers for themselves. Thankfully I have a few months yet to decide what I am going to do with myself, and for anyone who might be reading that's just started, or is about to begin their university experience, I say good luck, stay safe, and have lots and lots of fun! Fun is the name of the game at the moment. I think I had too much fun in Florida as I was struck down with a horrible fever-headache-sick-cough concoction that kept me in bed for a few days while we were over there. :-( I have some detailed posts of my jollies coming up in the next few days, but for now I wanted to poke my nose into cyberspace and say a quick hello, *waves*. I'm also trying to get organised properly and try to figure out a little but of order in my life, adjusting to the demands of a busy third year of dissertation writing and lecture attending excites me but also leaves me a little nervous at the same time. 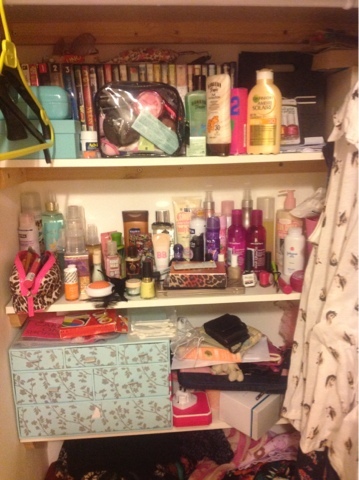 My head feels how my beauty shelves in my room at home looks right now (see below) all jolly, colourful and chaotic. I have lots of ideas and things to do floating around up there in amongst my brain cells, I'm just not sure how to figure it all out into a coherent order...yet. That being said, I have a list of post ideas for the near future including my USA beauty haul, my favourite products of the summer, some sans from Disney, my experiences of going away on my own for the first time, and some reviews of some fabulous products I have recently fallen in love with. My MAC giveaway also ends very soon, if you haven't entered, scroll back a few posts and enter as you wish! I think that looks fairly organised compared to mine...! LOVED my last year at uni, even the dissertation hell!